Terror group says peace agreement may fail if Israel eliminates terrorists who fire at IDF soldiers. 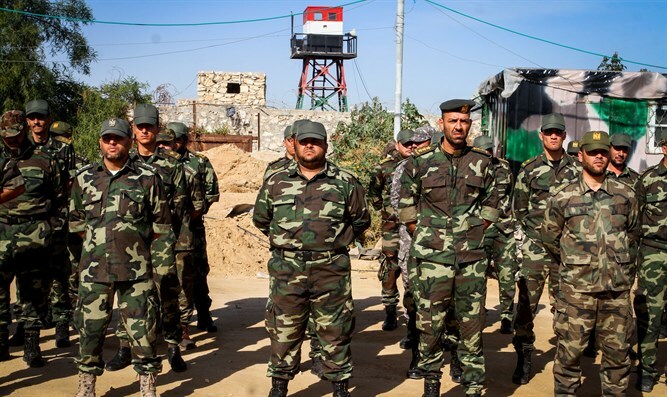 The Hamas terror organization on Tuesday afternoon slammed Israel's reaction to terrorists firing at IDF soldiers stationed near Gaza. In a statement, Hamas said, "This is a serious event which will have difficult consequences. Israel will not be able to sleep at night. Their attack will not pass without them paying a price." Speaking to a Palestinian Authority news source, Hamas officials estimated that Israel's elimination of terrorists would cause the Egyptian effort to broker a long-term ceasefire between Israel and Hamas to fail. Also on Tuesday, Israel Hayom reported that internal disagreements between the Arabs and within Hamas itself may cause the Egyptian efforts to fail. On Monday, London's Asharq Al-Awsat claimed that Hamas had agreed to a "gradual ceasefire" in exchange for Israel reopening the Kerem Shalom crossing.